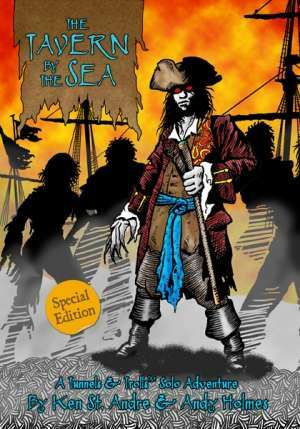 The Tavern by the Sea, by Ken St Andre and Andy R Holmes, is a mini solitaire adventure for use with the Tunnels & Trolls™ role-playing system.It has been designed for use with version 7.5 of the rules but could be adapted for use with earlier editions. Because this is a Mini-Solo Dungeon, no acts of magic will be allowed by the players -- don't use wizards in this scenario. You may use any humanoid (except Fairies or Giants) of 3rd level or lower, but this is a good opportunity to create a new character at the start of this adventure." This special UK version of this solo features additional material as well as completely new artwork by Jeff Freels. Jeff is a great friend to all of us at Tavernmaster Games and to the world of Tunnels & Trolls as a whole. He desperately needs a kidney transplant and all the proceeds from this project will be donated to his transplant fund. This title was added to our catalog on December 20, 2011.